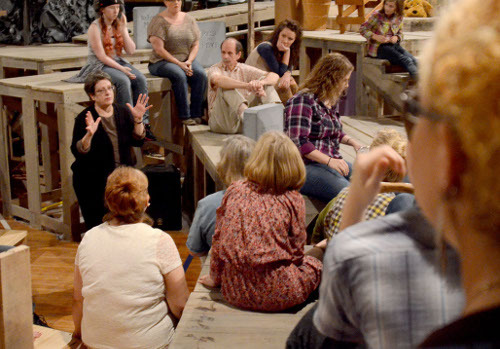 Ann Schertz is the musical director for the Higher Ground performances in Harlan County Kentucky. She believes in the power of culture to bring communities together to create a better future. When we interviewed Ann for the After Coal documentary this summer, she explained her belief that performance is where we practice what we want to be as a community. Schertz reflected: Performance is practicing together, playing together, moving together, singing together, laughing together, crying together. Doing these things together helps us practice a unity that isn’t always there when we’re scattered in our own individual lives. And it’s fun, as well. There’s big power in having that kind of fun. This sample of the opening number from Higher Ground 4, “Foglights”, provides a sense of harmony and unity that Ann brings to her work.